On 13 March 2019, the European Parliament voted on the final version of the European Accessibility Act, which sets common minimum accessibility requirements for certain key products and services that will help persons with disabilities to participate fully in society. This came after the European Commission proposed the act on 2 December 2015, the Parliament adopted its final position before starting negotiations with the Council in September 2017 and a compromise was reached in November 2018. Autism-Europe considers the proposal for the European Accessibility Act (EAA) has potential to improve accessibility for persons with disabilities throughout Europe. However, the final version EAA is disappointing due to its restricted scope. It is however a first step into the right direction, and it is key that the EAA is successfully implemented at national level. After the European Commissions initial proposal, Autism-Europe published a response to the proposal outlining a number of key recommendations to ensure that the specific needs of autistic people are not overlooked in the future Directive. 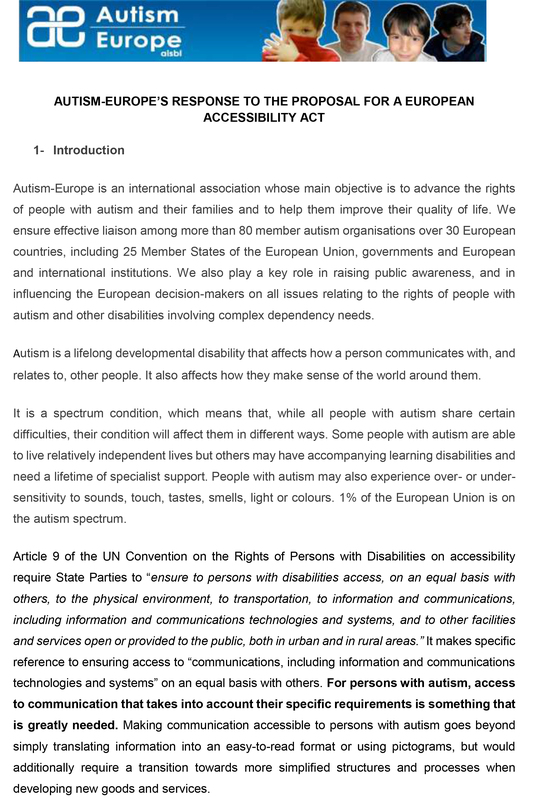 Autism-Europe also fed into the European Disability Forum’s official response to the legislative proposal. It followed on from recommendations given to the EU by the United Nations Committee on the Rights of Persons with Disabilities to swiftly adopt the European Accessibility Act with the participation of people with disabilities. For several years now, Autism-Europe has been advocating for EU legislation on the accessibility of products and services for persons with disabilities. This video, produced by the European Disability Forum, explains why the European Union need a strong Accessibility Act.